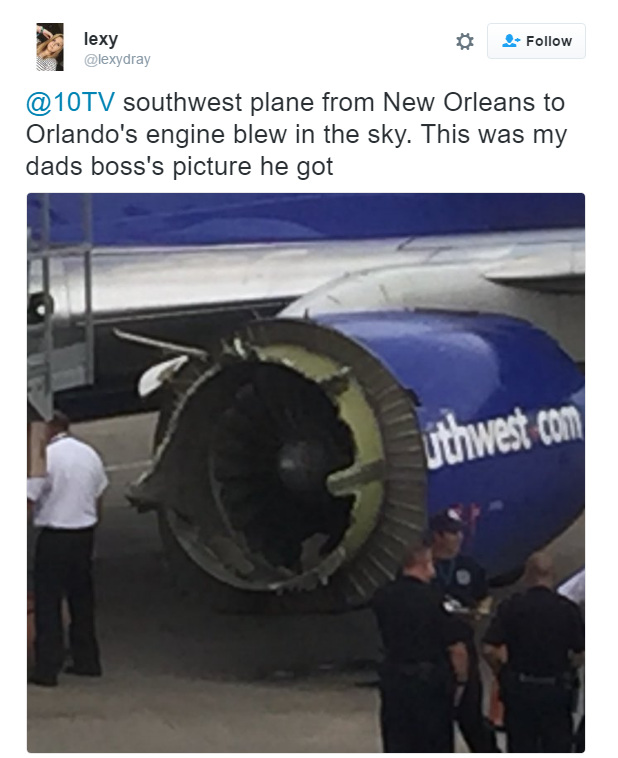 NEW ORLEANS – A Southwest Airlines flight bound for Orlando, Florida, made an emergency landing Saturday morning due to a major problem with one of its two engines. It’s rare for Southwest or any other major airline to have such serious engine trouble, said Michael Boyd, president of airline consulting firm Boyd International. 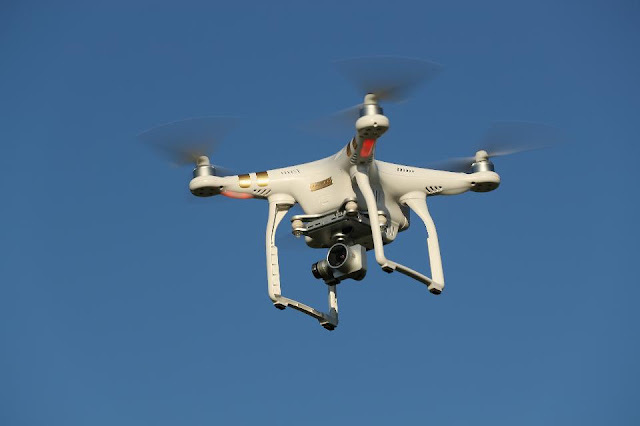 Nairobi, Kenya: Two police officers were injured after a chopper they were using for a training mission crashed within Wilson Airport, Nairobi. The chopper was taking off from the airport for a training session with an instructor and a trainee when it went down. It is not clear what caused the accident. Pictures of the chopper after the crash show its tail broken. Those on board sustained non-life threatening injuries in the 1 pm incident and were taken to hospital. Officials said the helicopter reg 5Y-COP was in good condition at the time of the incident. 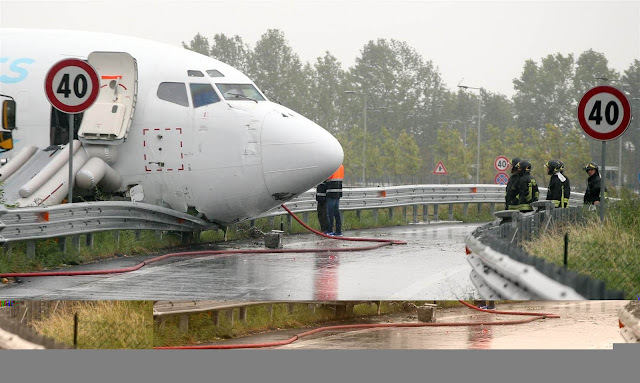 Emergency services were mobilized at the scene after the incident which also affected the taking off and landing of planes. 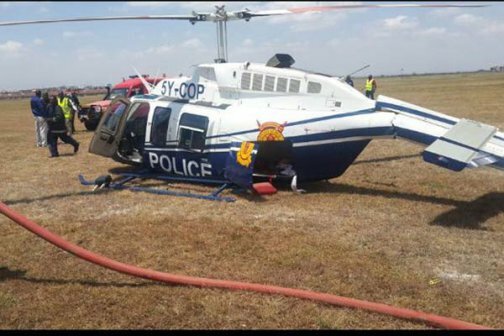 The Bell type is one of the choppers that are available for police operations and the accident takes the National Police Service back as it will take long to replace or repair it. The wreckage was preserved as investigators moved to the site to probe it. Police recently purchased a new helicopter and two other MI-17 helicopters are being refurbished to improve police ability to quickly move troops to any trouble spot and generally improve their mobility. The National Police- both regular and Administration Police air wing currently has 14 aircrafts- six fixed wing and eight helicopters that provide air support to ground forces including tactical reconnaissance, night reconnaissance, air observation, and casualty evacuation, especially in remote areas. Honey bees hanging from the exhaust nozzle of an F-22 Raptor engine on June 11, 2016 at Joint Base Langley-Eustis, Virginia. Rather than try to clear the bees from the jet themselves, crew members realized that honey bees are at risk of extinction and contacted local beekeeper and retired US Navy veteran, Andy Westrich, who proclaimed the hive the largest he had ever seen after being escorted to the aircraft. Westrich used vacuum hoses to wrangle the thousands of bees into several large buckets and safely relocate the colony. Before transporting the bees to their new home at a local beer production facility, Westrich took them to his house and found that the hive weighed nearly eight pounds in total, according to the Air Force release. But how do nearly 20,000 bees, weighing a collective eight pounds find their way onto the exhaust pipe of a fighter jet? They likely came from a much larger bee hive somewhere else on the base, according to Chief Master Sgt. Gregg Allen, 192nd Maintenance Group Quality Assurance chief, who also happens to be a beekeeper. The F-22 was able to resume flight operations once the bees were safely cleared. A multi-role, fifth-generation fighter, the F-22 Raptor began taking part in combat missions against ISIS in September 2014 after years of cost overruns and mechanical issues. It was originally designed and built to replace other fighter and ground attack aircraft in the U.S. military’s arsenal, but after years of cost overruns and mechanical issues, the Air Force acquired only 188 of them from aerospace maker Lockheed and doesn’t plan to have any more produced. Officials in northwestern Minnesota say a sheriff’s deputy was injured Monday morning by shrapnel in a shooting. The Polk County Sheriff’s Office says the deputy was in a U.S. Customs and Border Protection helicopter when gunfire struck the vehicle’s cab, causing acrylic shrapnel to hit the deputy. Earlier in the day, dispatcher reports had suggested the deputy has been shot with a high-powered rifle. The shooting happened around 10 a.m. in rural Fosston, near the border of the Polk and Clearwater counties. The chopper was flying over a rural area of Clearwater County after being tipped off to some suspected drug activity. Clearwater deputies quickly looked for a suspect and say they found 71-year-old Carstie Lee Clausen of Clearbrook, Minnesota, hiding in the woods. He was taken into custody. The deputy was treated at a hospital and released, the sheriff’s office says.The incident is being investigated on the local, state and federal levels. This is the moment an Emirates airline plane dramatically exploded into flames on the tarmac just moments after passengers had been evacuated following a crash landing. 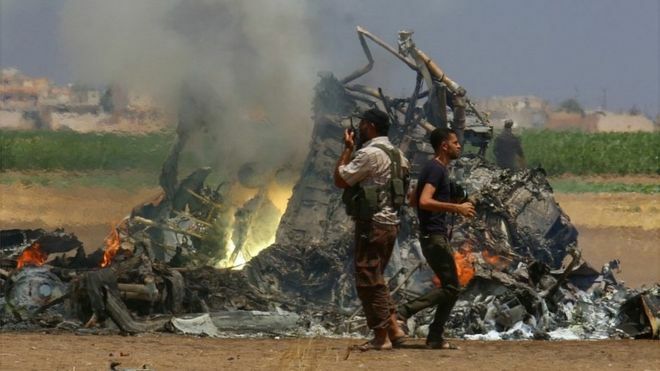 The Boeing 777-300 jet crash-landed at the airport shortly after 1pm local time (10am UK time) with 300 passengers and crew on board. 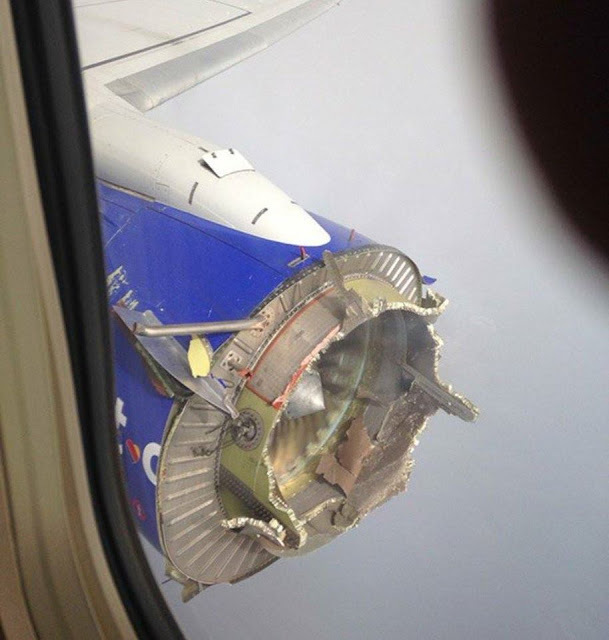 It is believed a fire broke out on Flight EK521 in mid-air before the pilot sent out an emergency signal. Miraculously, no passengers were seriously hurt and were safely evacuated just moments before eye-witness footage showed the plane burst into flames. The three-hour flight took off from Trivandrum International Airport in India at around 6am UK time before the captain is understood to have sent out and emergency signal shortly before the plane was due to land. No-one is believed to have been seriously injured and passengers have been safely evacuated. 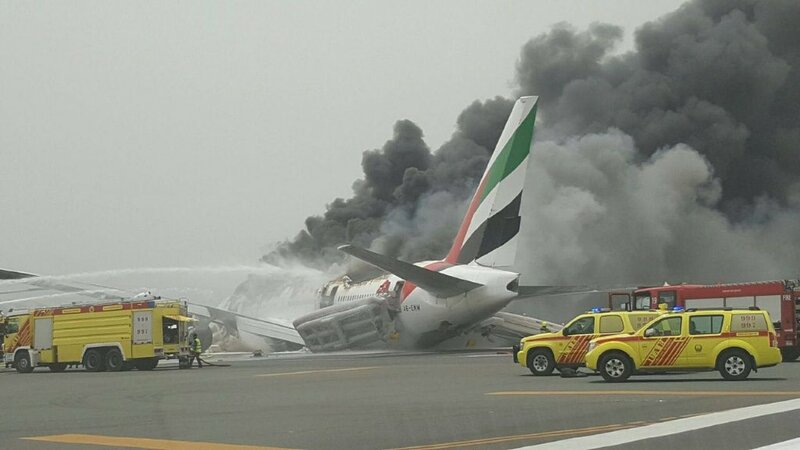 Emirates said it is not yet known what caused the accident but confirmed there had been no fatalities. 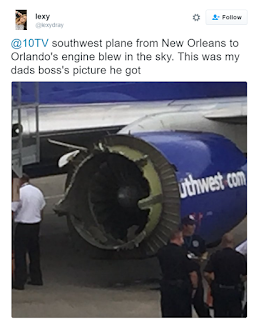 Eye-witnesses described seeing huge plumes of smoke rising from the plane before it crashed down onto the runway. pouring from its upper section. Dramatic video also showed the plane exploding in a ball of fire shortly after passengers were evacuated. Emergency services are currently on the runway. All departure flights from Dubai international, the world’s busiest airport for international travel, were delayed until further notice, authorities said. An Emirates spokesman said: “Emirates can confirm that today, 3rd August 2016, flight EK521 travelling from Trivandrum International Airport in Thiruvananthapuram, India to Dubai has been involved in an accident at Dubai International Airport. “There were 282 passengers and 18 crew on board. “The Boeing 777 aircraft, departed at 10.19am from Trivandrum International Airport and was scheduled to land at 12.50pm at Dubai International Airport. 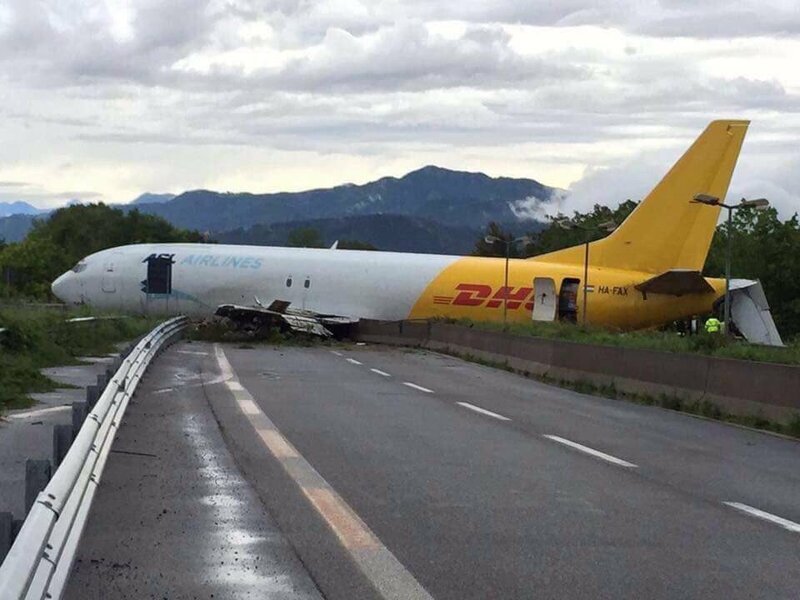 “We can confirm that there are no fatalities among our passengers and crew. All passengers and crew are accounted for and safe. The U.S. Air Force says the most expensive weapons system in its history is ready for combat. 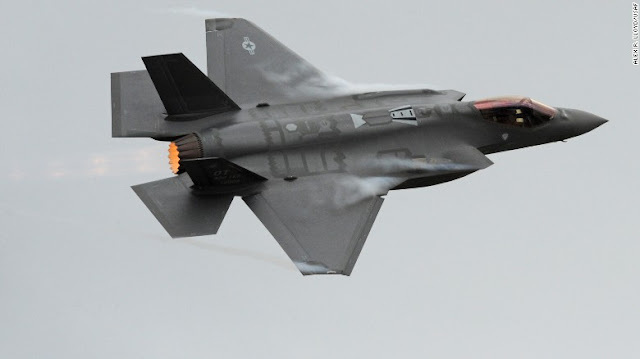 The service said Tuesday that its version of the F-35 Joint Strike Fighter, the F-35A Lightning, has reached IOC (Initial Operating Capability), meaning that it is developed enough and has passed the proper tests to be flown on combat missions. “The declaration of initial operational capability marks an important milestone as the Air Force will operate the largest F-35 fleet in the world with more than 1,700 aircraft,” the F-35 program’s executive officer, Lt. Gen. Chris Bogdan, said in a statement. “The F-35 will form the backbone of air combat superiority for decades and enable warfighters to see adversaries first and take decisive action,” he said. The designation marks a major milestone for the $400 billion program. The single-engine F-35 fighter jet is touted as the future of military aviation; a lethal and versatile aircraft for three military branches that combines stealth capabilities, supersonic speed, extreme agility and state-of-the-art sensor fusion technology, according to Lockheed Martin, the plane’s primary contractor. But the Joint Strike Fighter program has drawn sharp criticism after numerous hardware malfunctions and software glitches delayed the aircraft for more than three years and caused its budget to swell some $200 billion over initial estimates. “Any progress that helps our warfighters maintain air dominance is a good thing, and this marks an important milestone for the Air Force and for our air combat capabilities,” Rep. Tammy Duckworth, an Illinois Democrat, told CNN. “However, the F-35 development process has also been rife with delays and cost overruns, wasting billions of taxpayer dollars,” said Duckworth, a member of the House Armed Services Committee who has worked to bring more oversight to the F-35 acquisition process. In 2014, the entire fleet of F-35s was grounded following an engine fire during testing, and the program has experienced persistent software problems that have slowed mission testing and resulted in schedule delays. 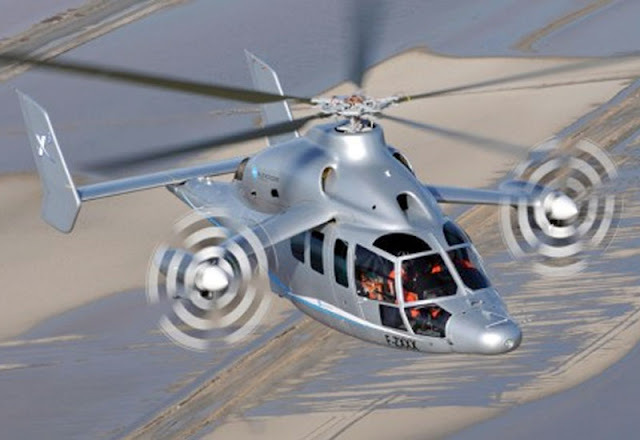 There were also setbacks at key milestones, including the start of the flight test program, delivery of the first production-ready aircraft and testing of critical missions systems, according to the GAO. And a cloud of skepticism still hangs over the program, even with Tuesday’s announcement. “This is nothing but a public relations stunt,” said Dan Grazier, a fellow of the Project On Government Oversight, a government watchdog group. To maintain and operate the Joint Strike Fighter program over the course of its lifetime, the Pentagon will invest nearly $1 trillion, according to the Government Accountability Office (GAO). Despite a controversial history that has spanned more than 15 years, the Air Force’s certification that its variant of the F-35 is ready for combat marks the most significant sign, to date, that the next-generation aircraft is finally close to realizing its potential on the battlefield, according to Lockheed Martin. “With the F-35A, the Air Force now has a fighter combining next-generation radar-evading stealth, supersonic speed, fighter agility and advanced logistical support with the most powerful and comprehensive integrated sensor package of any fighter aircraft in history,” said Jeff Babione, the general manager of Lockheed Martin’s F-35 Program in a statement to CNN. “It will provide airmen unprecedented lethality and survivability, a capability they will use to defend America and our allies for decades to come,” he said. Originally conceived in 2001 to upgrade the U.S. military’s aging tactical fleet, the single-seat F-35 has slightly different forms and capabilities to meet the needs of each military branch. The Marine Corps declared the first squadron of its F-35B variant ready for combat in July 2015 with the intention of upgrading and resolving the software issues that still plagued the aircraft at the time before its first planned deployment in 2017. While the Air Force has had to wait more than a year longer than the Marines to reach the “combat ready” milestone, the significance of reaching this point in the development process is amplified due to the number of planes it has requested. The Air Force plans to buy 1,763 of the 2,443 total F-35s ordered by the Pentagon. 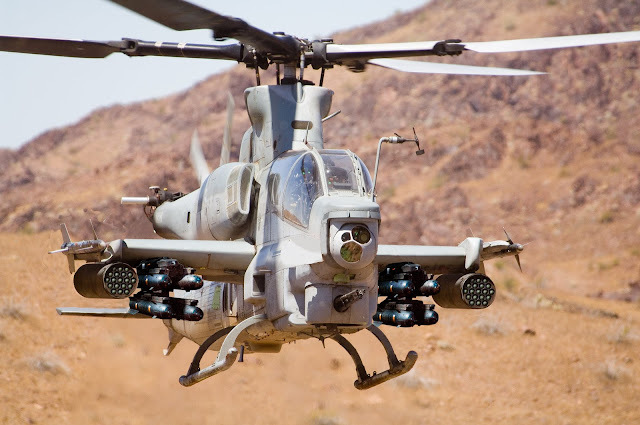 And the service’s confidence in its version of the aircraft, despite pending tests and software upgrades, is evidence that the program has gotten back on track in recent years, according to Pentagon officials. Officials have also pointed to the progress made by the Marines’ F-35 variant since it was declared combat ready as another sign that the program’s major problems are in the past. It’s “ready to go right now,” said Lt. Gen. Jon Davis, the head of Marine aviation, when asked last week if the F-35 could be deployed for combat missions if needed, adding that the aircraft could even fly missions against ISIS in Iraq and Syria if called upon. Last week, the Air Force’s F-35 variant completed its first successful air-to-air “kill” test, destroying a flying drone with a missile launched from the aircraft’s wing. The F-35 also made its international debut in July at the Farnborough airshow in the United Kingdom. It is intended for use by the U.S. Air Force, the U.S. Navy, the U.S. Marine Corps and 10 foreign countries. The Navy plans to declare its version of the F-35 ready for combat in 2018.